Leaving England in September, 1904, I set out for a four months' tour in the Antipodes. My first experiences of Australia were unfortunately by no means as pleasant as they might have been, for I had to go into hospital very soon after my arrival in Sidney. I was not able to fulfil any of my engagements for quite five weeks, owing to both my arm and my knee again giving way. I was suffering from what are commonly called a housemaid's knee and a miner's elbow, which means water on both joints, necessitating an operation. This was successful, and I was able to get to work, touring through all the principal towns and meeting all the wrestlers of note whom I could come across. Prior to my arrival in the Southern Continent, the two wrestlers who had enjoyed the biggest reputations were two big Hindus, Buttan Singh, and Gunga Brahm. Both of these were fine big men, with plenty of strength and considerable skill, yet I threw the pair of them in nine minutes on the same night. Clarence Weber, however, the Champion All-round Athlete of Australia, a most splendidly built young fellow, managed to hold out for ten minutes on more than one occasion. I may say, though, that I did not make any special preparation for either of these encounters, and owing, of course, to my having to wrestle different opponents nearly every night, I was naturally a bit weary and lacking in fire and vigour. As Greco-Roman wrestling was not well understood in Australia, I found it occasionally difficult to fix up matters with the various opponents who presented themselves and was in consequence compelled to devote my attention seriously to the study of the "Catch-as-catch-can" style. This was an important stage in my career and, considering that I was practically staking all my hard-earned reputation on my prospects of success under these new and comparatively strange rules, a somewhat risky step to contemplate. Nevertheless I accepted the situation, and can sincerely acknowledge that I have never regretted having done so. After a fairly considerable experience, I may now confess that I distinctly prefer the more open method, and do again propose deserting catch-as-catch can. I have indeed made publicly a declaration of my determination never to wrestle under Greco-Roman rules again. By the way, on one occasion while in Australia, I was challenged to wrestle in the Cornish style of wrestling, in which a fall is secured only when a wrestler is thrown on any three points, viz., both shoulders and one hip, or both hips and a shoulder touch the ground. All bouts are contested from a standing position, and a hold is secured on the jacket which each contestant has to wear. My challenger, Delhi Nielsen, who was an experienced Cornish wrestler, may perhaps have imagined that at this style (to which I was quite unaccustomed) he my very probably enjoy a comparatively even chance with me. He having defeated over 400 opponents and possessing an untarnished record was, in fact, very confident. He consequently refused to wrestle me, save under these conditions, and I was compelled to agree to his terms, trusting that my acquaintance with the Russian style of wrestling, with waist-belts (between which and the Cornish style there is a very faint resemblance, although tripping is prohibited under the Russian rules), might stand me in good stead. Be that as it may, I was able to rise to the occasion and to throw him very easily. Having completed my Australian engagements, during the course of which I defeated Grotz, who was called the Champion of South Africa, and several other prominent wrestlers and physical culturists, I paid a brief visit to New Zealand, and then sailed for America, where I was booked for several engagements, the most important of all being my return match with Tom Jenkins, the American champion, whom I had defeated under Greco-Roman rules at the Albert Hall on July 2, 1904. On my way across the Pacific, I made a brief stay at the island of Samoa, and can well understand the enthusiasm with which travellers in the South Seas always refer to these havens of bliss, the islands of Polynesia. I had promised to meet Jenkins in this return encounter in New York, after the London contest, and now agreed that our second meeting should be under "Catch-as-catch can" rules, with which my opponent was more familiar, but at which style I had but little experience, save for an occasional encounter in England and more frequently during my Australian tour. This match with Jenkins, however, was the first big one in which I had engaged entirely under "Catch-as-catch-can" rules, and considerable interest was, perhaps, naturally felt throughout America on this account. Jenkins and I met before a huge crowd at the Madison Square Gardens, New York, on May 4, 1905, our respective weights being as follows: Jenkins 14 st. 4 lb. and my own 14 st. 12 lb. I was not yet sufficiently versed in the style at which we were wrestling to forestall the clever leg-locks and holds by which my opponent contrived to postpone disaster. He was mostly on the defensive, wriggling and extricating himself from difficulties in a very able manner, but despite a very strenuous struggle and a determined bridge, I finally managed to lever him over and pin him down in 31 min. 15 sec. He seemed very exhausted, but recovered well, and exhibited considerable liveliness when we met for the second bout. He secured a "half-nelson" and a crotch-hold, and several times initiated an attack, but I did not experience much difficulty in breaking clear from the holds he managed to secure, I gradually wore him down, and finally fixing a "half-nelson," forced him over despite his struggles, pinning him down for the second time in 22 min. 4 sec. New York, May 5 - Geo. Hackenschmidt, the Russian Lion, defeated Tom Jenkins, the American champion wrestler, in two straight falls last nigh at Madison Square garden, in a match in which Jenkins was handled like a pigmy in the hands of a giant. 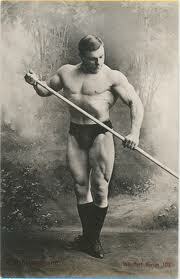 Hackenschmidt broke holds as if they were the clutchings of a child. For half an hour the Russian Lion battered Jenkins without a moment's cessation. The older man's vitality began to ebb. Suddenly, Hackenschmidt got an "half-nelson" lock on him-both hands under the chest and clasped around his neck. Inch by inch he twisted Jenkins over, still over, till both shoulders touched the mat. But Referee Hurst did not see the fall and signalled to go on. Within a minute, Hackenschmidt repeated the feat, and this time he kept his man bored down until Hurst dragged him off. Time 31 min. 15 sec. Tom was still tired when he came back fifteen minutes later for the second bout. Patiently, bravely, unflinchingly, almost hopefully, he put forth all his cunning and strength. Once, as they stood face to face, Hackenschmidt seized Jenkins under his arms and whirled him around in a furious waltz. The body of Jenkins stood out straight, his feet pointing at the horizon. Twice thus around he went; then Hackenschmidt slammed him down on the floor. Tom wriggled around so that his shoulders did not touch the mat. It was a wonderful exhibition of quick thinking under adverse circumstances. But Tom's bolt was shot. No mere human giant could last under the awful strain of handling Hackenschmidt. After 22 min. and 4 sec. The Russian again put Jenkins down with a "half-nelson." Poor old Tom was hardly able to walk out the ring. Hackenschmidt dashed away as briskly as ever. "I would like to have thrown him quicker," he said, "but several times when I had good holds on him he turned white and I was afraid of hurting him, so I let up." Despite the strenuous nature of this match, I felt very little fatigue or exhaustion afterwards, thanks to my excellent condition. I was able to demonstrate this on the following evening, when I was matched to throw a half-a-dozen wrestlers of considerable local prominence under Greco-Roman rules. This was a fairly still contact, but I managed to dispose of the whole half dozen inside eighteen minutes. James Parr, the old Lancashire wrestler, then challenged me to throw him the next evening, offering to resist being thrown three times within the hour. He was, of course, giving a fair amount of weight, but as he is a very skillful wrestler I consider that I did not do at all badly by pinning him down three times in 7 min. 50 sec. During my tour in the States I had a rather amusing experience in St. Louis. I was there match against Jean Baptiste, who was the champion wrestler of the district. As soon as the match was started I was attacked my malarial fever, and, consulting a doctor, was ordered to bed, where I speedily became much worse, my temperature rising as high as 105 degrees. Under these circumstances, and specially as the doctor considered my condition to be highly critical, I sent to the match promoters and informed them that it would be impossible for me to fulfil my engagement on the date agreed. They called to see me in a state of great distress, Represented that their outlay had been considerable, that they had sold a large number of tickets, and that if they were forced to return the money they had received for these they would be completely ruined. They implored me to meet Baptiste and used so many arguments that I was practically compelled to assent, provided I found myself able to leave my bed, and although I was still very ill on the day of the match I managed to struggle down to the scene of our encounter. Arrived there with the doctor by my side, I felt so weak, ill and giddy, that I could not summon up sufficient energy to change my attire, and was sitting shivering and shaking with fever, when I overheard my opponent in the next dressing-room asserting that he would not meet me, as I should be sure to kill him. The promoters were busy trying to encourage him, and as a last resource brought him into my dressing-room that I might assure him the I would be gentle and would handle him tenderly. I was able to do this confidently, as at the moment, I fet scarcely strong enough to wrestle with a child. However, the humour of the situation so appealed to me that I had difficulty in restraining my laughter, and after Baptiste, now somewhat more courageous, had retired to get ready I was able to undress and get into my wrestling trunks. I felt somewhat better, but was still so weak that I positively reeled as I mounted the steps in the raised platform on which we were to wrestle, and experienced considerable difficulty in getting through the ropes which surrounded the mat. Once there, my strength seemed to come back to me, and the sight of my timid adversary nerved me to go through with the ordeal. In the state of nervousness and terror, he was, perhaps, not a very formidable opponent, but he was, nevertheless, very big and strong, and but for the nervous strength with which I have been endowed and which seemed to suddenly dome back to me in full tide, I might have had a stiff bargain. However, as matches went, I did not experience much trouble, throwing him three times in fairly quick time, and subsequently a Turk, Ali Muralah by name. This last opponent was styled "the terrible Turk," but I had never heard of him before that day, nor have I heard of him since. After which I returned to bed and to my doctor's care and indignation. He was very wroth and told me that I had practically done my best to commit suicide, but my constitution pulled me through, and I have since experienced no ill effects from my adventure. After finishing my engagements in the States I paid a visit to Canada, where I threw such opponents as I could meet with. The most formidable of these was the celebrated French-Canadian, Emile Maupas, a strong and clever wrestler. He is adapt at the reversed body hold, which he tried on with me, but barely succeeded in lifting me from the mat, then losing his balance and falling backwards. I threw him three times in less than twenty-one and a half minutes, the first fall occupying 7 min. 33 sec., the second 6 min. 19 sec., and the third 7 min. 20 sec. After visiting the Falls of Niagara, and doing a little sightseeing, I again set sail for England, where I was booked to appear for a week in Manchester, before appearing at the Canterbury Music Hall on Whit-Monday.